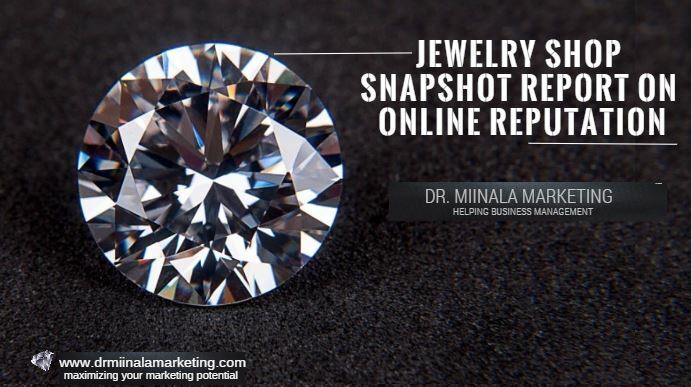 Dr. Miinala Marketing has announced the availability of a new report that is designed to help jewelry shop owners learn about the status of their online reputation. The free report on the online presence and visibility of jewelry shop owners will help them realize if their reputation needs to be enhanced with the goal of driving more traffic to their websites and getting more customers to their brick and mortar locations. A spokesperson for Dr. Miinala Marketing recently stated that "These reports will show jewelry shop owners if they are being viewed online by local customers and if they aren't, they will help us to determine what steps need to be taken to change that." The company states that online reputation in today's digital age is essential for any business that wants to see an increase in the number of its customers. The report shows the jewelry business how popular they are online, which the company states is imperative in gaining website traffic as well as shop customers. The company says that through various solutions, such as establishing a LinkedIn business page, jewelry shops can ensure that they are being found by local customers. Many consumers today research businesses online before buying from them. The spokesperson for Dr. Miinala Marketing states that without an online presence, businesses are losing out on customers that may simply go next door to a competitor who has customer reviews and other online presence aspects. "You have to have an online presence today," states the company spokesperson. "Even if you don't sell jewelry online, people have to be able to find you and they can only do that if you establish and maintain a positive online reputation." Dr. Miinala Marketing offers solutions such as a Facebook page for clients that let them interact with customers and build that ever important online presence. The company states that business who are unsure of what their online reputation is or those who do not have an online presence can contact them to learn more about the services that they offer. Those interested can visit the company online to learn more about the snapshot report for jewelry shop owners or to find out more about other services.